Today I headed out after work to fish the Deschutes at Mecca Flats. One of the perks of waking up at 4:30 AM to go to work is having a bit of fishing time in the afternoon when you get off of work. 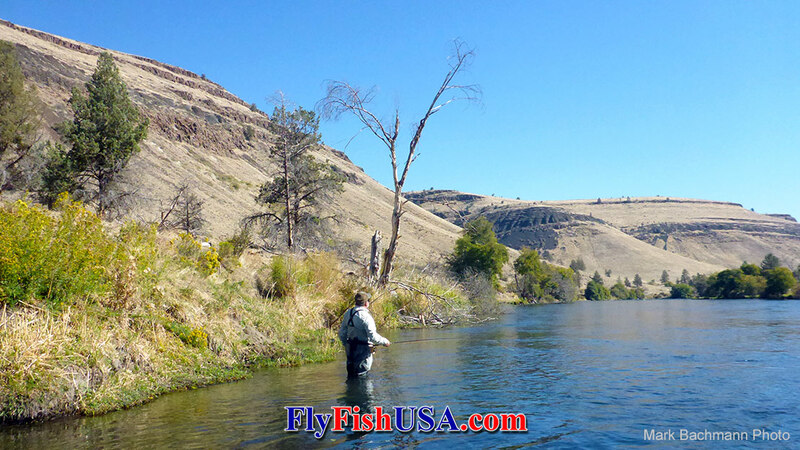 One of the perks of trout fishing the Deschutes on a Monday in the fall is that there isn’t much competition. In fact, there weren’t any cars in the parking lot at all! Where is everybody? I had a 6 weight set up for single hand streamer fishing and a 5 weight for dry flies. The plan was to swing a sculpin for a bit and catch fish, then to fish October Caddis dries and get annoyed that the fish wouldn’t take a big stimulator. I got out on the river around 3, and started working my way down the inside of a set of bookshelf type riffles. I hadn’t made 10 casts before I was in to a spry redside in the 16-17 inch range. Maybe the water temperature is just right, or maybe I’ve just been catching too many trout from stillwaters recently, but the fish I caught were all more energetic than usual. If I had closed my eyes while I was swinging, I might have thought I had a steelhead on for the first run or two. 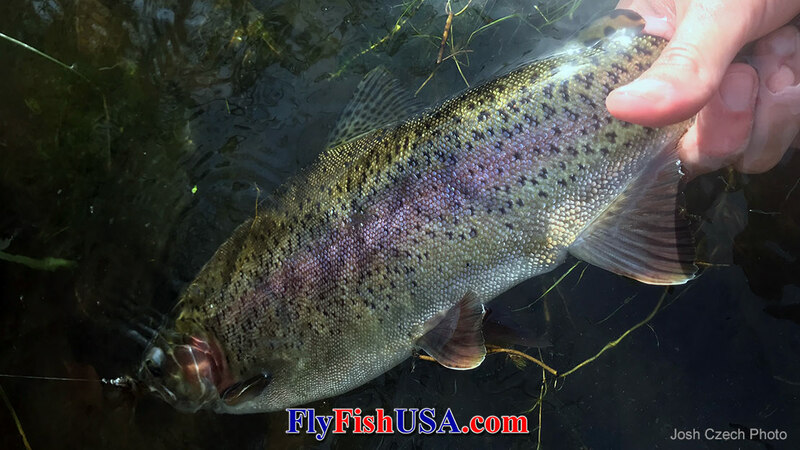 I swung up a few more redsides in about the same size class over the next hour or so, and then started hiking downstream to fish a few of my favorite dry fly runs closer in to the bank. The first little spot I fished (it’s the one where there’s a rock and some grass on the bank) held one of the fattest young trout I’ve ever seen. If it were a character in Charlie and the Chocolate Factory, it would definitely be Augustus Gloop. Fortunately though, the Deschutes isn’t part of a chocolate factory (as far as I can tell, but with PGE you never know) so the fish didn’t get sucked up a tube when I put it back in the river. So, with that first fish on the stimulator down, I had a bit more confidence I headed to the next back eddy and immediately saw a large fish smack an October Caddis on the surface. “Interesting” I said to myself, as I knelt down to hide my profile and watch the river a bit more. As an aside, I would like to say that this is an area I feel like most anglers could improve on. If you see fish rising and you get excited, remember that you have plenty of time to target the fish. It ain’t going anywhere, and it’s not going to stop eating until you hook it or spook it. Give the fish some time to reorient itself in the current, and assess your casting situation. Could you move somewhere and make an easier cast without spooking the fish? How will the current affect your cast once it’s on the water? These things could make the difference between hooking a fish and getting a refusal or even putting the fish down with a bad cast or silhouette on the water. However, you can do all these things correctly, but if you recently hit a sage bush with a cast and didn’t check your tippet, you might just break off a big fish and lose your only good October caddis imitation. This is exactly what happened to me. It is one of the most commonly broken cardinal rules of fishing, especially with trout size tippets: always run your fingers over the line to check tippet after a possible abrasion. So I tied on a new piece of 5x tippet and a size 16 X-Caddis, and drank some lukewarm Gatorade as an offering to the fish gods. Fortunately, the fish gods were merciful today, and the X-Caddis produced well. I don’t think I made a cast farther than 20 feet for the last 2 hours of daylight so don’t worry about bombing casts out with the dry flies. The water temps, cloud cover, and sun angles right now are very conducive to fish holding in readily accessible lies. And if you don’t stay until it gets dark, you are missing the best fishing by a mile. The fish get more surface oriented, they get more reckless, and the only downside is that it gets dark quickly and a 16 inch redside takes about 5 minutes to get in on 5x. I was able to fish until about 7:15, but the last 15 minutes were more of an audible experience listening for the slurp than a visual experience seeing it. That sunset is only going to get earlier and earlier, so the sooner you can get out there the better. If you are swinging, swing across quicker and at a sharper angle than you would for steelhead. Throwing a twitch or a jerk in every so often doesn’t hurt either. 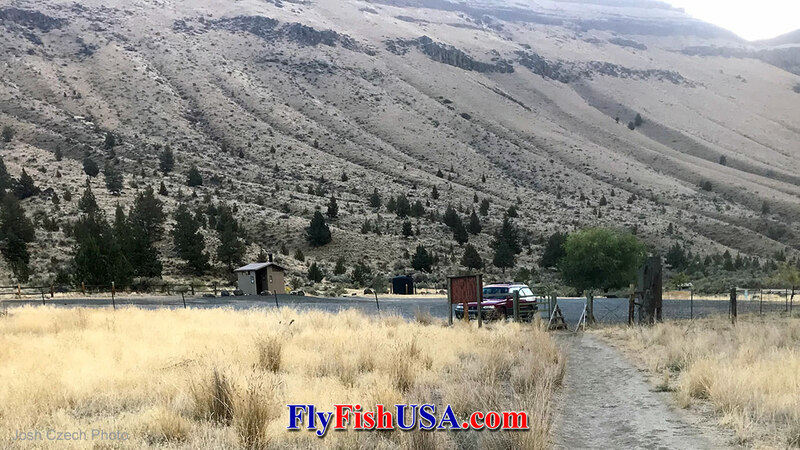 I’ll put my swing approach for steelhead vs. trout this way: with a steelhead you are usually convincing it to eat, with a trout you are usually challenging it to eat. The steelhead numbers are down, but the trout numbers are as good as ever. Get on out and fish!